The following are photos of camera in a box systems. These systems were "state of the art" and considered leading edge technology about 30 years ago. Sure some of the outdated camcorder "jack-in-the-box" systems are about useless, but that is no reason to discard them and fill up valuable space in a county trash dump. With a little imagination, these goofy U.S. Postmaster approved camcorder boxes can be made useful once more. 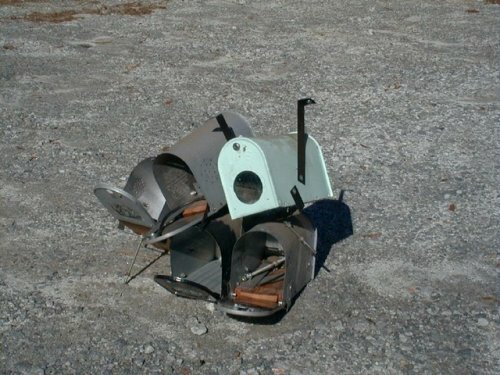 These would make wonderful birdhouses or small pet containers once the sharp edges are removed.